"You are perfectly healthy for any Vulcan on the high side of 100." In this episode, we find the crew of the Enterprise muddling around with parallel universes. When a landing party attempts to beam back aboard the ship during an ion storm, Kirk, McCoy, Uhura and Scotty find themselves in a parallel universe where they serve not the Federation, but the Empire (cue the Star Wars Darth Vader march music here). In this vaguely fascistic society, nearly everything else is the same besides the completely amoral behavior of its inhabitants. Crew members gain promotions by assassinating their superiors, terror is a way of life and Spock thinks nothing of annihilating a planet as an example (can we say Alderaan?). Scotty has to figure out a way to send the foursome back to their own universe before the ion storm ends and their chances vanish. While this story has some interesting ideas, there are just too many holes in the situation to make it very credible. If the way of life were so completely different, there would hardly be such similarities (down to an acid stain on one of the medlab tables which is exactly where the one is in the proper Trek universe, as McCoy notes). Yet there are few only outward dissimilarities, such as a beard on Spock, a scar on Sulu and some gold sashes on the uniforms (though Kirk also gets a gold lame vest and Uhura gets a wild peekaboo outfit). Oh, and being captain of the ship apparently also earns one a concubine, in this case Marlene (Barbara Luna), which just seems to be fine with the Kirks of both worlds. Random stuff: Bones says, "I'm a doctor, not an engineer." Kirk gets two smooches. George Takei gets to overact a little by being the leering security officer who paws Uhura. Look for the incredibly blatant use of doubles who don't match Spock in the least during the fight scene. Although no Shirtless Kirk, the vest gives us far too many looks at his armpits. Yet another landing party in trouble story, this episode features Kirk, Spock, McCoy, Scotty and Chekhov as a group who beam down to Gamma Hydra IV to the annual check on the scientific expedition there. They find the bunch of hapless red shirts, aged horribly. Returning to the ship with those twenty-year-old octagenarians who still survive, all except Chekhov find themselves aging at the rate of thirty years per day. As Kirk and Spock get older, a passenger, Commodore Stocker (Charles Drake), relieves them of duty and heads for the nearest Starbase...by going through the Romulan Neutral Zone. Oops. Can the aging be reversed and the Enterprise be saved? Other than a highly contrived resolution, this show is a much more satisfying experience. The dual threads of the problem of aging and senility tied with the inexperienced Commodore Stocker makes for excellent suspense. The resentment of Chekhov at being a guinea pig for trying to find the cause of the aging is nicely played and gives Walter Koenig something a little meatier than his usual "Yes, Keptin." Dr. Janet Wallace (Sarah Marshall), an endocrinologist along for the ride, who just happens to have been Kirk's fiancée six years earlier, lends an interesting dimension. At first she goes for the older Kirk, having a thing for older men, but when he starts drifting into senility she is visibly repulsed without saying a word. Shatner of course wildly overacts as he starts to lose his marbles, but there is plenty of entertainment value to be had there. He does manage a nice piece of work when he greets Spock in his cabin after the competency hearing; even though he has been blustering about how he can still run the ship, Kirk knows that he has been relieved of command without waiting to hear the word. Random stuff: Bones says "I'm not an engineer, I'm just an old country doctor." No smooches for Kirk, though he gets close a couple of times. A lengthy Shirtless Kirk episode is included. 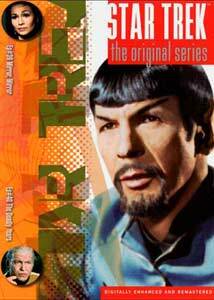 In both episodes 39 and 40, Kirk calls Spock "traitorous." A highlight is Kirk falling asleep in the command chair on the bridge. This episode rates four Enterprises out of five. Image Transfer Review: Once again, the DVD version of these programs puts every other format, including the original broadcasts to shame. Indeed, the image quality is a little too clear, for we can see the greasepaint used to age the characters in The Deadly Years. Blacks are excellent as are colors. No bleeding or noise is evident. Although stock shots exhibit some grain (no doubt in the original), the picture is quite nice overall. Audio Transfer Review: The audio is a rather subtly remixed DD 5.1. Directionality is subdued, but present upon careful listening. No hiss or noise is to be heard. At times the theme music sounds a little shrill, but otherwise the sound is excellent. Dialogue is clear throughout. Another round of beautifully restored classic episodes, demonstrating the dangers of being in an Enterprise landing party. Worth a look, especially to see some very different facets of the crews' personalities.